Whether it’s what makes us tick or what makes love last, take a look at some of some of the things driving us in our lives and how you can gain more control to be in the driver’s seat in yours. Take the lead : motivate, inspire, and bring out the best in yourself and everyone around you / Betsy Myers with John David Mann. What makes love last? : how to build trust and avoid betrayal / John Gottman and Nan Silver. Add more ~ing to your life : a hip guide to happiness / Gabrielle Bernstein. Self-therapy made easy / Marian Van Eyk McCain. What makes us tick? : the ten desires that drive us / Hugh Mackay. Leadership Week, established by The Sir Peter Blake Trust to celebrate and develop leadership for all New Zealanders, has been highlighted at Wellington City Libraries this week with a great display of books and magazines to inspire us all. You can find biographies, books about leadership generally, and interesting features in magazines to encourage good leadership, both in your own life and in those around you. The display will be up for another week or you can find inspiring items about leadership anytime – try a search under ‘leadership’ in our Easyfind catalogue for some further suggestions, or ask a staff member to guide you if you’re not sure where to look. 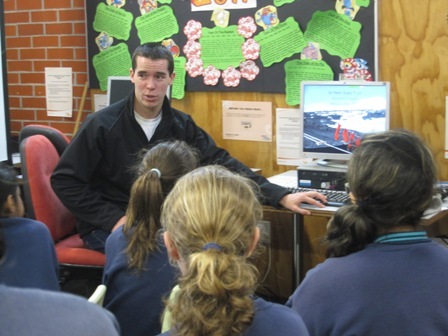 And on Wednesday 18 young leaders from Tawa Intermediate were inspired by Jamie Clark, 2010 Antarctic Youth Ambassador for the Sir Peter Blake Trust, as he shared his experiences and encouraged them to grasp every opportunity available to develop their leadership skills and abilities. Leadership Week officially ends on Friday 8th July with national Red Socks Day – make sure you wear your red socks in support of The Sir Peter Blake Trust, set up in the name of a great New Zealand leader and working to inspire all Kiwis to be great leaders in our own way every day.